I need to squeeze this in, before the plums are gone – it seems every year I wind up putting up jars of jelly and chutney that I’m most excited about having once cheese season begins. That is, the holiday party season during which I seem to be putting out a cheese board every few days, even if it’s just for whomever is sitting around our kitchen table. 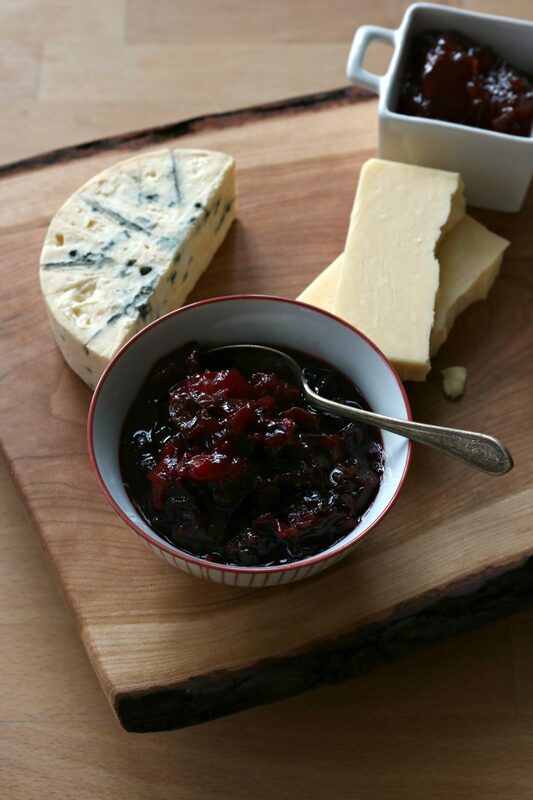 And one of my favourite components of a cheese board is the little bowl of rosemary-apple jelly or tart plum or apricot chutney. Of course a deep plum chutney is equally at home with samosas or roast pork, but mine inevitably gets doled out with cheese – plums make a perfect pairing for cheese of every texture and intensity. It’s simple to simmer a batch, and measurements are approximate – this is also a great way to use up plums that are starting to get wrinkled or squishy. If you’re nervous about the jarring process, don’t sweat it – keep it in the freezer, in small quantities in ziplock baggies, even, and its sugar content will keep it from freezing solid. Spoon (or squeeze) it out into a bowl whenever you’re ready for it, and it will thaw quickly. 1In a medium pot, heat a drizzle of oil over medium-high heat and sauté the shallots for a few minutes, until soft and starting to turn golden. Add the plums—if they’re very ripe, you can crush them with your hands right over the pot, removing the pits with your fingers—and the remaining ingredients. Simmer for 20-30 minutes, until the chutney is thick, soft and jam-like. Cool and refrigerate for up to a month, or freeze for longer storage. Makes about 2 cups. A good chance to use the last of my plums! Is this recipe approved for canning? How long should you process? Thank you! Hm… I’m not sure how long I’d process this. I like making it easy and keeping it in the freezer! Amazing, this is the best way to cook! Once again you’ve inspired me! Going to make this using my frozen prune plums and also making your newly posted mandarin orange jam!